In yet another twist in the tumultuous 2000 election, House Republicans Thursday suggested television networks may have skewed their reporting of last week's election results to favor Democrat Al Gore. CBS News Chief Washington Correspondent Bob Schieffer reports the Republican congressmen contend networks may have delayed calling victories in states where Republican George W. Bush was narrowly ahead to make it appear that Gore was sweeping the night. That may have convinced many Bush supporters not to vote, the Republicans allege. 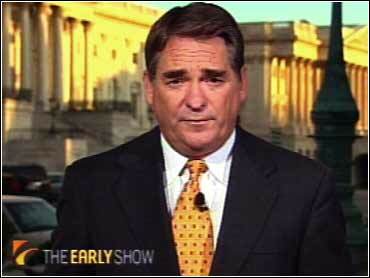 Saying the events of election night presented a "very disturbing picture, I think, of probable bias," Rep. Billy Tauzin, R-La., said he plans to hold hearings on the network projections either in December, when Congress returns to its lame-duck session, or more likely when the new Congress convenes in January. "By calling the Al Gore states early and delaying the calls on the George w. Bush states you receive a picture of America believing that Al Gore was sweeping the country and George W. Bush was having trouble carrying his states," said Tauzin, who chairs the Subcommittee on Telecommunications, Trade and Consumer Protection. Between 7:49 p.m. and 8 p.m. EST Tuesday, NBC, CBS, CNN, Fox and ABC all called Florida for Gore. Some two hours later the networks began pulling back that projection as actual vote counts revealed how close the race was. Early Wednesday the networks declared the state for Bush, effectively giving him the presidency, but then had to retreat again when the vote ended in a near tie. The AP did not call the race for Bush, either in Florida or for the presidency. Rep. Cliff Stearns, R-Fla., said the early call giving Florida to Gore could have affected thousands of votes in the state's Panhandle, a stronghold for Bush where the polls closed an hour after the rest of the state because the area is in the central time zone. Under a 1985 agreement, the networks usually have withheld using voter exit polls to call elections until most polls in a given state are closed. Earlier this week, elections officials in at least three counties in the Florida Panhandle said they had no evidence of voters discouraged by the network calls. But the centrist Republican Leadership Council said Thursday it had commissioned a phone survey of more than 35,000 Panhandle voters in which 2,380 Bush supporters said they decided not to vote after hearing that Gore had won the state. Reps. Peter DeFazio, D-Ore., and Jim Leach, R-Iowa, introduced legislation to form a bipartisan 12-member commission on elections integrity. House Majority Whip Tom DeLay, R-Texas, prepared a two-page memo about the House role in the Electoral College process. Sen. Barbara Boxer, D-Calif., asked the General Accounting Office to examine state election laws and practices for rules on fraud, error and irregularities. Sen. Arlen Specter, R-Penn. proposed a commission to study ways to ensure speedy and accurate reporting of election results. Sen. Charles Schumer, D-N.Y., said he call for a study by the Federal Election Commission on alternative voting methods. Rep. Jerrold Nadler, D-N.Y., wants a commission to look into how to simplify voter registration and voting. The Congressional Black Caucus has written Attorney General Janet Reno seeking a formal investigation into allegations of voting discrimination against blacks. Rep. Chris Cox, R-Calif., said calling Florida and other crucial states like Pennsylvania and Michigan for Gore while polls on the West Coast were still open was in part responsible for the lowest turnout in California since 1972. Cox said this year, the outcome of several close House races in his state that went to Democrats might have been affected because Republican voters were discouraged. Tauzin said that, in preparation for hearings, his staff would be talking to the Voter News Service about how election-night calls were made. VNS is a consortium of the networks (including CBS) and The Associated Press that uses voter exit polls and actual results to help make election projections. CBS News officials denied the charge of bias, saying decisions were delayed only when there was insufficient data to make an accurate call. In a statement, CBS News president Andrew Heyward said, "The accusation that there was bias in CBS News reporting of the election night results is completely without foundation." CBS officials said the calls that were made quickly for Gore came only when there was heavy statistical evidence to support them. In cases like Gore's home state of Tennessee and West Virginia, where Bush eventually scored upset wins, analysts waited for more data because those victories went against past voting patterns. CBS News announced earlier this week that it was forming a panel, which includes an outside expert, to study the network's election night performance. CNN Chairman Tom Johnson, in two letters to Tauzin Thursday, said he would name an independent advisory committee to look into what went wrong in the news network's election night coverage. But he added that "as chairman of CNN, I statcategorically there was no intentional bias in the election night reporting." We take this matter very seriously and intend to review all of the facts so that we can institute changes to ensure that this situation does not occur again." Media critic Tom Rosenstiel said botching the Florida call means the networks have plenty to answer for, but dismissed the idea they tried to manipulate results. it's just too great a risk to take," he said. "It doesn't make sense."